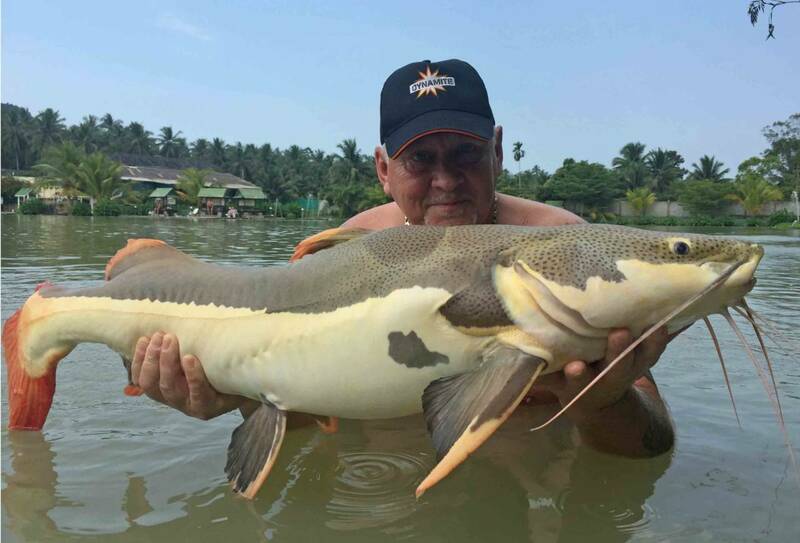 UK based angler Keith Standley took some Robin Red and CompleX-T boilies on a Thailand fishing trip and enjoyed the holiday of a lifetime. 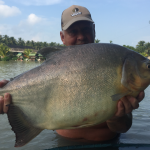 Fishing with a friend, the pair landed no less than 134 fish including a giant 220lb Arapaima using a mixture of 20mm Robin Red boilies and CompleX-T pop-ups. 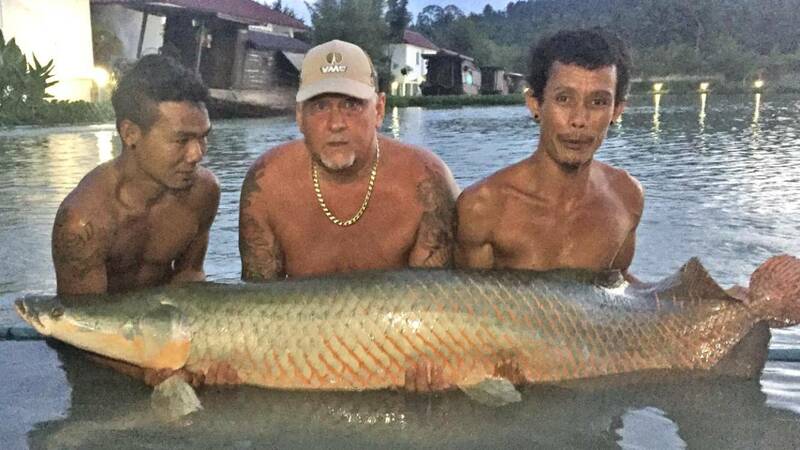 The duo were fishing on Koi Samui’s Top Cats fishing complex in Thailand where they banked 12 different species. MORE…. So, finally after many months of waiting a Sunday morning knock on the door at 7 am came, the cab had arrived to pick me up for the journey to Heathrow Airport after picking up me buddy for the trip. Under an hour later we were booking in to Thai Airways and having an early morning Whiskey in the Airport Lounge. A 12 hour direct flight to Bangkok was perfectly on time, then we moved through the Airport to a one hour flight to Koi Samui again all on time and we were met by the Top Cats Cab outside Departures. One hour later we were greeted by Shaun McNutt the owner of Top Cats and had our first taste of Chang Beer. 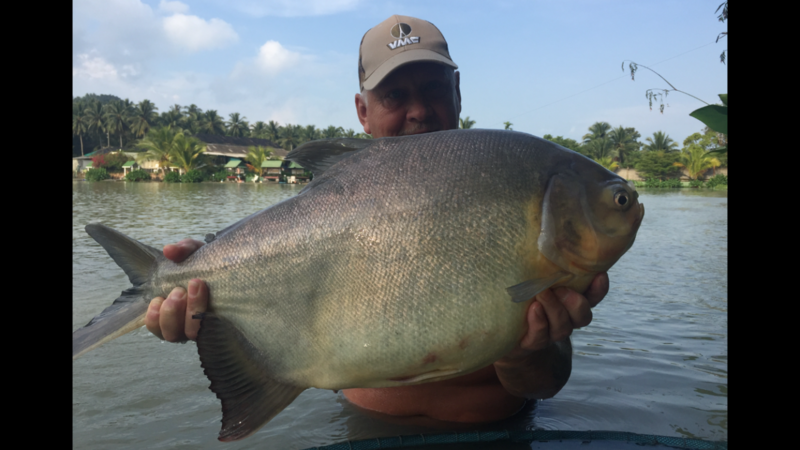 We settled into our bungalows and had a good nights sleep and we were in our adjoining swims with rods cast out with our guide Tam by 8am. 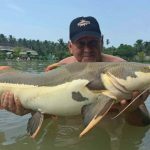 The action started within 15 minutes when we both had a siamese carp one of 30lb and 40lb and to be honest the action did not stop for the rest of the trip. They do supply bait which includes home made boilies and bread crumbs to create a method mix. Boilie is the way to fish until the evening when one rod is upgraded and changed to dead bait for the predators. I think we definitely had the edge by using Robin Red Stick Mix mixed with bread crumbs as a feed as Method feeders are used here. Hookbait was a 20mm Robin Red hardened hookbait tipped with a Complex T washed out pop up. The fish could not resist this combination and action was had all day long. At around 5pm (fishing is up to 8pm) we changed one rod to upgraded gear and a dead bait. 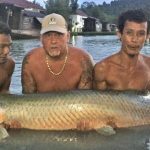 In the evenings I had red tail cat fish to 90lb but was really waiting for an Arapaima. I had lost two Arapaimas during the week as these are hard to hook. I was now down to 1 hour to go on the last day I was still hopeful but my belief was fading, at this point the dead bait rod did scream off underneath one of the junks moored there and after learning what to do after losing two I hit this run three times to set the hook good and proper. In the dark the fight was finally over after 15 minutes as it slid over the specially adapted landing cage – OMG I had one ! All fish are not removed from the water at Top Cats and photographed in the water. I could not wait to get in up to my waist with this beast and with the help of two guides who gave me advice on how to be careful, stand still and keep quiet as these fish can be very moody and dangerous. As the three of us lifted this 220lb fish belief set in. Totals between us whilst there was 134 fish landed and over 60 fish lost but 12 different species, absolutely fantastic. 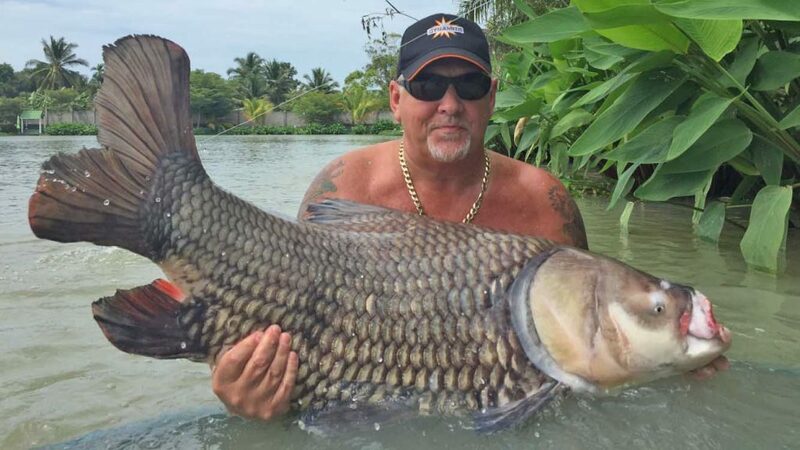 A few tips that may help you if you get to Thailand would be definitely take some hardened hook baits, pop ups are a definite need and two tips for those Arapaima set that hook good and hard and keep that rod low for the early part of the fight or your create the fish too come out and crash the line.